Stand Easy screens were produced in the 1980's & 1990's by Chris Larking ( retired ). They were very popular and supplied to studios in many countries, at the peak Stand Easy sold 50 screens to The Hit factory in New York and later another 50 screens to Criteria Studios in Miami. Top UK studios Abbey Road and Olympia were among the UK users. As the demand for large studios decreased the demand for screens also declined and manufacturing ceased. THE STAND EASY CLASSIC RANGE. Are manufactured using a welded mild steel frame with offset legs to allow the screens to be placed at 90 degrees with one another, the screens are fitted with casters. 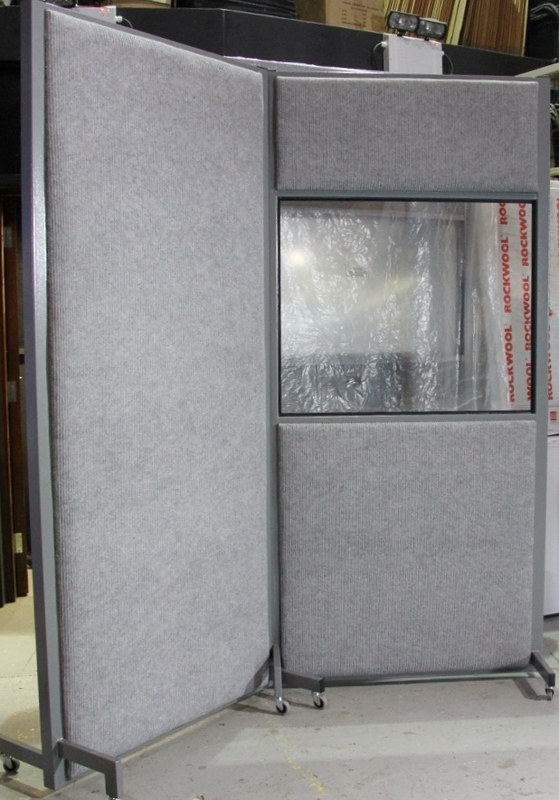 The acoustic panels consist of a dense panel covered with 50 mm of RW3 Rockwool on either side and then covered with light grey carpet providing an absorbent surface on both sides. Should the user require a choice of performance one side can be covered with wooden slats in place of the carpet to provide a reflective surface where a live sound is required. This option is chargeable. Classic Stand Easy screens are available in 3 versions. Short Screen 103 cm tall 105 cm wide. All Stand Easy Classic screens are fitted with heavy duty casters. E&oe. Prices correct at time of publication but may be changed without notice.